The so-called "wrist snap" in golf is critical to getting your club face in the proper position during a golf swing. It also contributes to a follow through that allows you to decelerate the club naturally after contact so you can maintain club speed during your shot. Knowing how and when to turn your hands over during a golf swing will help you maintain accuracy, decrease slicing and hooking, and generate more power and distance. Place the ball slightly forward in your stance. Use this ball placement for shots that require full swings and a wrist snap. Short shots such as chips, pitches and putts use little or no wrist action. Place your club head on the ground behind the ball in the position you would like it to face at contact. This will give you a reference point for getting your club in this position at contact. Move your wrists slightly backward to begin your shot, releasing tension in your forearms. Push your arms backward with your shoulders rather than pulling your shoulders backward with your arms to maintain proper alignment. Move your hips forward after you have finished your backswing to begin your forward swing. Let your shoulders pull your arms forward. Turn your forearms forward slightly before contact so that the palm of your right hand -- if you are left-handed -- faces your target as your arms straighten. Continue the natural rotation of your hands forward after contact so the palm of your right hand now leads your follow-through, ending up with your right hand touching your left shoulder. 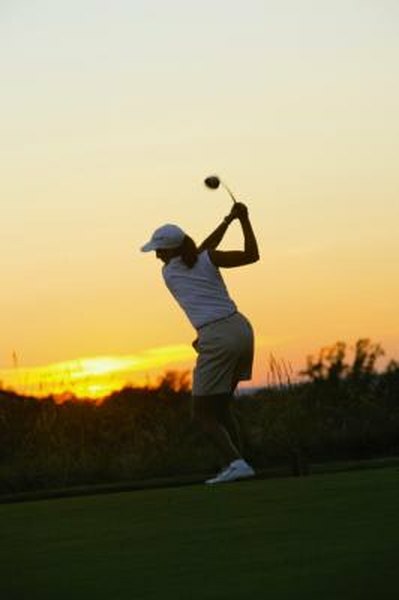 Golf Digest Woman: Top 10 Power Tips for Women: Avoid the "Chicken Wing"